One of the ladies who helps me tremendously with our Threads of Love Ministry is expecting her second child. I wanted to do something really nice for her, so I made her girls matching dresses. This is the baby bishop. I used Ellen McCarn's pattern and have for years. It is my go to for bishops. 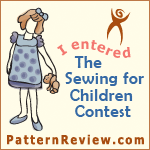 I used a smocking pattern I found in Sew Beautiful issue 105, 2006. It is a pattern for Maja's Heirloom's Larkin pattern which is the dress I made for the older girl. I'll have that one posted very soon as a review. I added lace to the sleeves with entredeux. It's been a very long time since I've done that! But I found it's like riding a bike. Thanks for stopping by. Please feel free to ask questions or share comments. They are so very sweet! You do excellent work.